Mountain Pals offers boarding and day care for your canine companion in a home environment. Dogs who thrive off-leash our most common guest as the terrain isn’t as leash friendly up here in the mountains as it may be in the flat lands. Every day is different so we can cater to the health and happiness of each animal in our care. Minimize their destructive behavior at home. Avoid household accidents and become house broken sooner. Get a good night’s sleep. A tired puppy is a well-behaved puppy who is more responsive to learning good manners. We require a “Meet and Greet” before your first scheduled drop-off day to learn about your dog’s social skills with help from our resident canine Maize, and to give you a tour of the home where your dog will stay. We can also provide animal transport from your house to our mountain adventures in a new 2011 Tacoma we’ve specially tricked out for canine comfort. 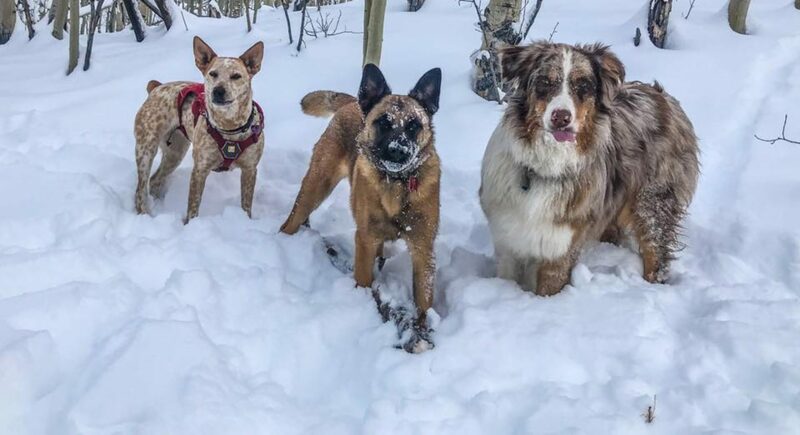 Rebecca Cardennis, founder and owner of Mountain Pals, began working with animals in California shelters, where she learned valuable positive reinforcement and behavior training. Next, she honed her skills for several years as a Veterinary Technician in numerous specialty practices. Animals are very special to her, and she provides them with high quality care when they’re under her roof. She is skilled in administering treatments from SQ fluids to injections. If your animal has special needs that require medication, a nurturing caregiver with a medical background is ideal. We take special care of geriatrics, so no worries there. At Mountain Pals, animals generally don’t spend time in kennels, they are treated like members of the family, just like they are in your home. If any dog needs time alone, we have a couple of large crates handy, but those are usually only for house training puppies. We understand that coming over from Summit County to Alma is sometimes hard depending on your travel direction. For a small $15.00 fee each way, we offer pick-up before you leave or drop-off once you are home. (we prefer to know that you have at least landed safely before dropping any dog at home incase that you may be delayed) Our 2011 Tacoma is 4×4 enabled so Mountain Pals can travel when needed in rain, sleet, or snow. use positive reinforcement methods. Let us help them practice their Sits, Stays, and Rollovers and of course work on their off-leash hiking skils while you’re at work! Does your dog have any sensitivities? We will dedicate some one-on-one time to you and your pup, teaching you how to help him behave in the way he potentially can. Your whole family, canine included, will enjoy a more fulfilling life by knowing one another’s boundaries. Mountain Pals also visits felines and other small animals, including exotics, in their home environments where we believe they do best. We can visit once a day, or as needed, to make sure they are happy and getting proper attention.